"Soo tasty!" Whip out your great sword, carve up some harmless herbivores, and then set up your BBQ spit on the spot to cook your newfound goods to a cutesy jingle. Yum! It's MEAT! On the bone! 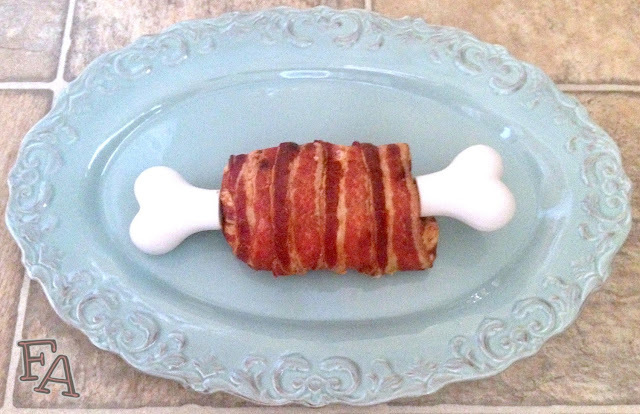 Inspired by the video game "Monster Hunter Tri"and the awesome bone corn cob holders shown below, this stuffed meat wrapped in bacon will satisfy the hungriest of hunters. 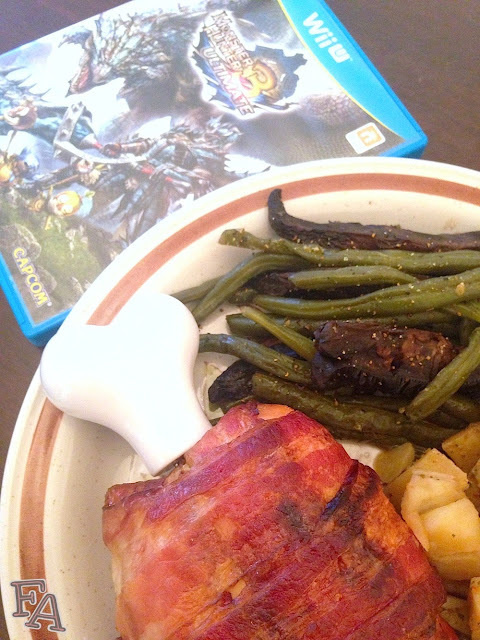 I made this meal for B for Father's Day because he likes "Monster Hunter", but mostly because we LOVE bacon in our household (& Smalls calls it "makin'"). 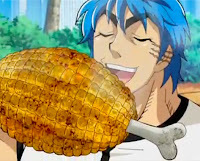 This recipe for meat on the bone can be matched up with many video games, animations, and books/comics but concerning the faux bones in particular, they'd be perfect for corn on the bone from the manga/anime "Toriko" (the meat on the bone is perfect for Toriko too). Build a campfire or fire up your grill, wrap your cobs in aluminum foil and place them over the heat for about 10 mins. Stick the bone holders into the corn after the cobs have been removed from both the heat and the foil. For awesome flavor, before wrapping in foil, spread mayonnaise on the corn and sprinkle with powdered parmesan cheese and salt & pepper. Add chili powder for a little kick. Note: The filling in the recipe below is made up of onions, red pepper, mushrooms, parsley, & feta cheese. You can totally change it up if you like! Just make sure that any foods you choose that are similar to the onions, peppers, or mushrooms are cooked/tender before you wrap them in the meat. 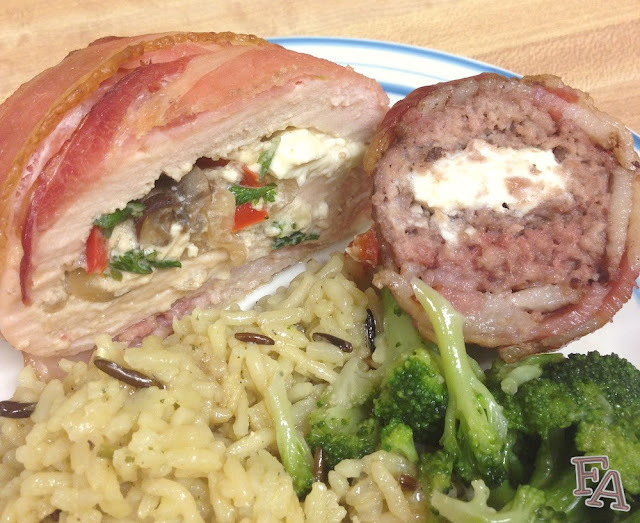 You could also simply fill the meat with cheese like feta, chèvre, or cream cheese. Yum! 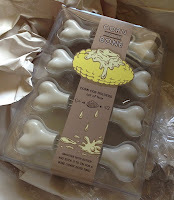 Corn Holders: The "Corn on the Bone" corncob holders (shown left) are available at the NeatoShop or Amazon. They're kind of expensive though so here's a simple alternative made from pieces of poster board or card stock plus toothpicks! Simply cut out a whole bone shape from sturdy paper, one bone for each piece of meat, and then cut it in half. 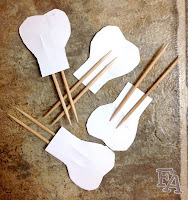 Tape two toothpicks to the undersides of the bone halves, and then stick the paper bones into the ends of the cooked meat right before serving. The paper will soak up some of the grease from the bacon, but it won't be too bad! If you wanted to go the extra mile, you could stick a layer of clear packaging tape onto the bone cut outs, making sure to fold a piece over the cut end that will be resting against the bacon. 1. Preheat the oven to 350°F. Put the oil in a pan over medium heat & cook the onions, red peppers, & mushrooms just until tender. Remove from heat. 2. 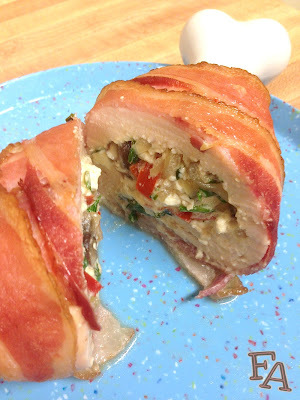 If using chicken, lay bacon strips on a plate, 3 one direction & 2 perpendicular, laid on top. 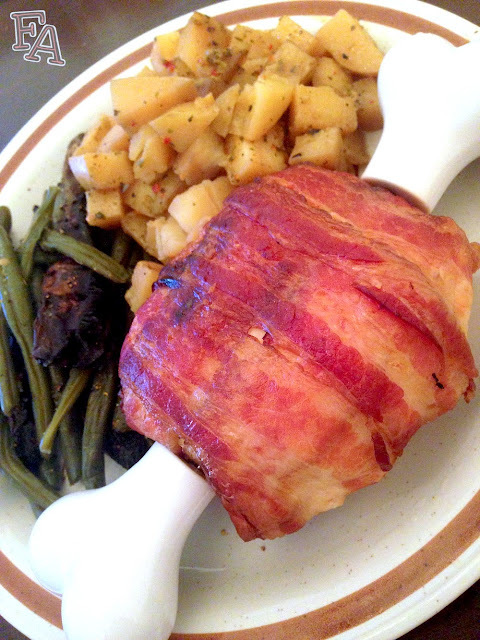 Slice the chicken open from one end to the other & spread flat on top of the bacon. Place a mound of the onion/red pepper/mushroom mixture in the center of the chicken. Place a few chunks of feta cheese on top along with some fresh parsley. Fold the chicken over the mound, stretching it to cover. 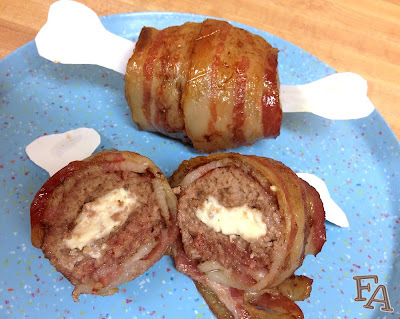 If using ground beef, lay bacon strips on a plate, 2 one direction & 1 perpendicular, laid on top (in the image above there's 2 & 2 in the first shot, but it's better with 2 & 1). Grab a palm sized wad of ground meat & half it. Flatten out one half & fill it with some of the onion/pepper/mushroom mixture, adding on some chunks of feta & bits of fresh parsley (also great with CHEESE ONLY filling). Flatten out the other half of the ground beef & place it over the mound. Press the edges together & roll it into an oval. 3. 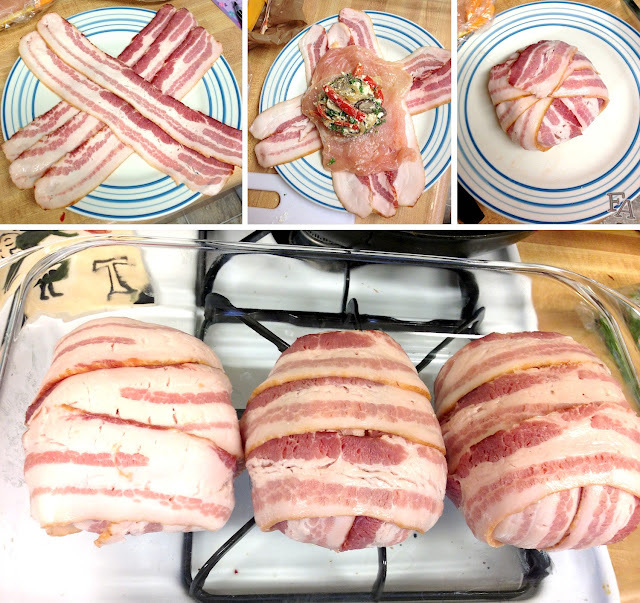 Place the filled meat on the center of the laid out bacon & fold the bacon over the meat. Stretch the bacon as needed to cover the meat completely. 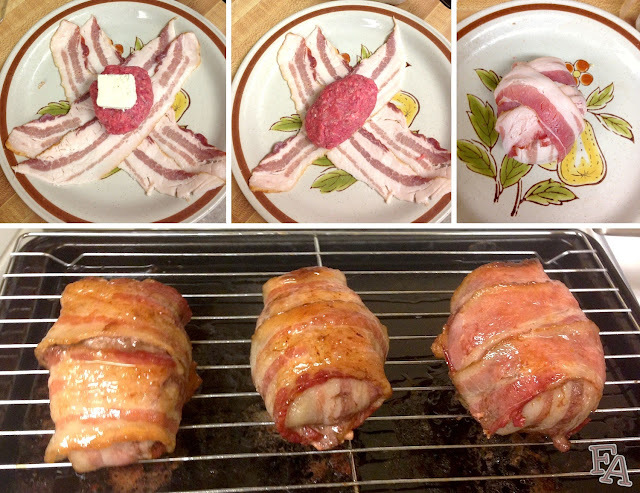 Place the bacon wrapped meat, seam side down, in a glass baking dish or on a wire rack over a baking tray (with sides) & place it in the oven. 4. Bake at 350°F for 35 minutes. Then broil the top of the meat for a minute or 2 & then turn the meat over & broil the bottom for about 4 mins (the bottom needs to cook longer because of the thickness of the bacon). Remove the meat from the oven & let it cool for a few minutes & then stick the faux bones in the ends & serve with hearty sides! Seriously so tasty... You wrapped this meat on bone, looks good. The presentation of dish is fabulous. And preparation of dish is in detailed view Grass Fed Meat Online Thanks!